@tobydiva has been compiling 'Social Media GPS' - a Tweet-book made up of interviews and comments sourced through Twitter. I contributed to chapter 6 with comments about RSS. 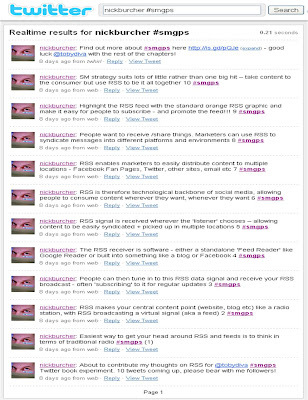 I tweeted my thoughts and appended them with the hash tag #smgps. @tobydiva then picked them up and added them to the Tweet-book. #smgps is an interesting experiment in crowdsourcing, though it's tough to construct thoughts into 140 character snippets of information. My jury is still out on whether this method of publishing is particularly viable, but having said that I enjoyed adding my thoughts to the debate! 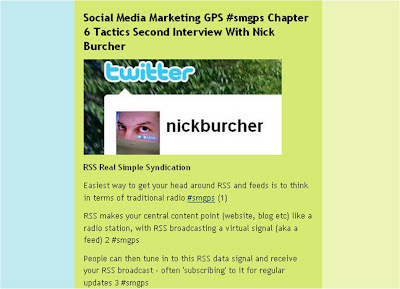 The book has some great contributors and has some interesting info on a range of SM topics - have a look at Social Media GPS here. Thanks for joining me (and the SM Twitter community!) 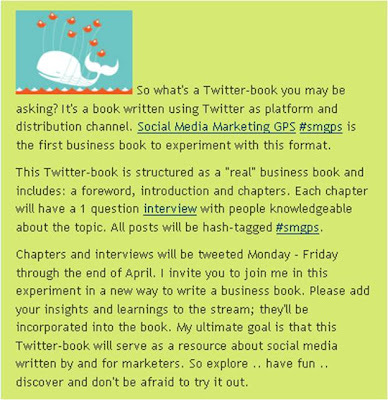 in this adventure of writing the first business book using Twitter as the platform and distribution channel. Your tweet-interview is of great value. The feedback I'm getting is that the Twitter-book is a great resource of bite-size information. Someone else called it a "white space" book.